Walking conditions – Mainly tarmac paths. Gravel/soil footpath adjacent to Loch Lomond can be muddy or even submerged during particularly wet weather. Otherwise accessible by buggy. Balloch is one of our favourite places. It’s a small yet bustling town sitting in one of Scotland’s most picturesque landscapes. There’s loads for the children to do so it’s always a popular choice of destination. Park at Loch Lomond Shores Shopping Centre. The only down-side about parking here is that you might end up abandoning your walk and instead go shopping, visit Sea Life (watch out for two-for-one offers otherwise it’s quite expensive), or go for a coffee and soft play at the Tourist Information Centre. You can even visit the Maid Of The Loch paddle steamer. The route really starts just beyond Sea Life. Take the path going North East. After about 200 metres you cross a road and the path bends off to the right and follows the River Leven for a few hundred metres. You then cross the road bridge and turn left to take the path at the river’s edge. 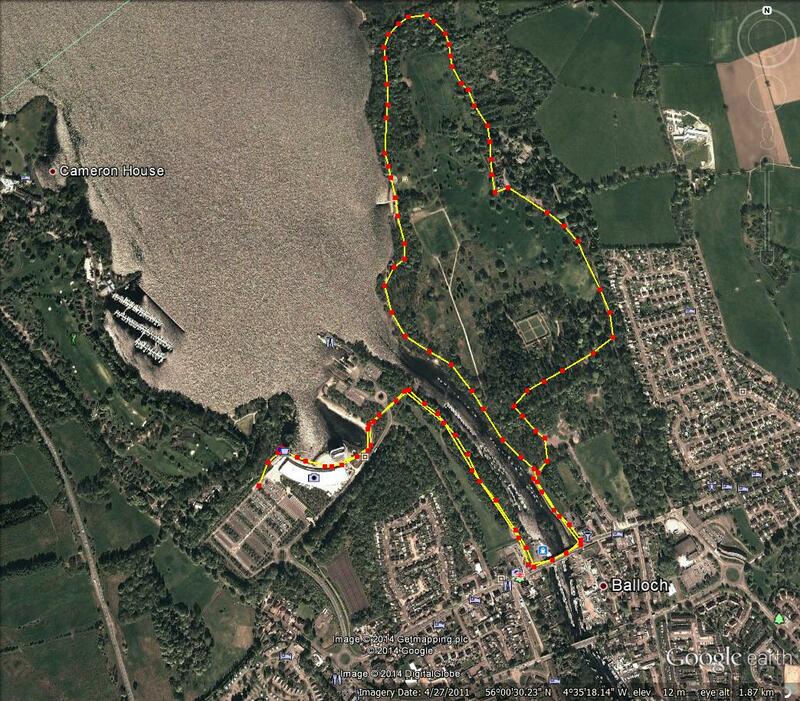 From then on in it’s basically a big loop around Balloch Country Park. We usually do it in an anti-clockwise direction. This involves an easy ascent along tarmac paths past Balloch Castle (great spot for a picnic). The path then leads you down along the edge of Loch Lomond. Keep walking until you get to the road bridge you previously crossed. Return via the same route. 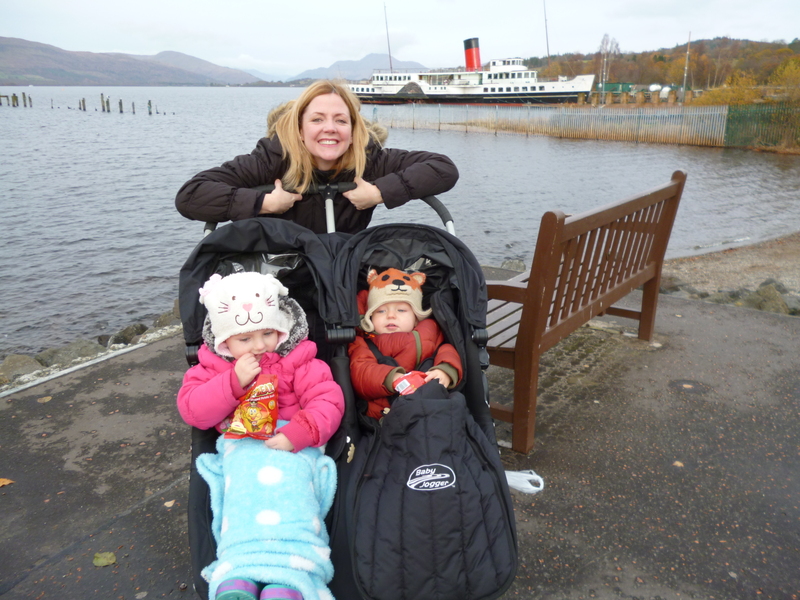 This entry was posted in Loch Lomond and Trossachs and tagged buggy on November 22, 2014 by scotlandwalkswithchildren. Walking conditions – Good, well-defined footpath. Slightly steep ‘Summit Path’. No difficulties. The first time we visited Inchailloch Island we were part of a large group on a guided tour with a Loch Lomond Park Ranger. Unfortunately, after about five minutes a boisterous, uncontrollable two year old who we all know and love prompted us to abandon the guided tour and instead wander around the island by ourselves. This turned out to be the perfect scenario as it enabled us to explore the whole island. And what an island it is! Go to the Boat House at Balmaha (next to the Oak Tree Inn) and find out when the next boat to Inchcailloch leaves. They’re pretty regular (I think they run from around 0900-1700) and throughout the whole year. The ten minute boat trip takes you to the Inchcailloch North Jetty which you can see from the Boat House. When you get on the island simply follow the well-marked footpath (Central Path). This path leads directly to the beach/barbecue site of Port Bawn which is at the other side of the island. As you walk along this path you will see a marked path on your right leading off to the burial ground. 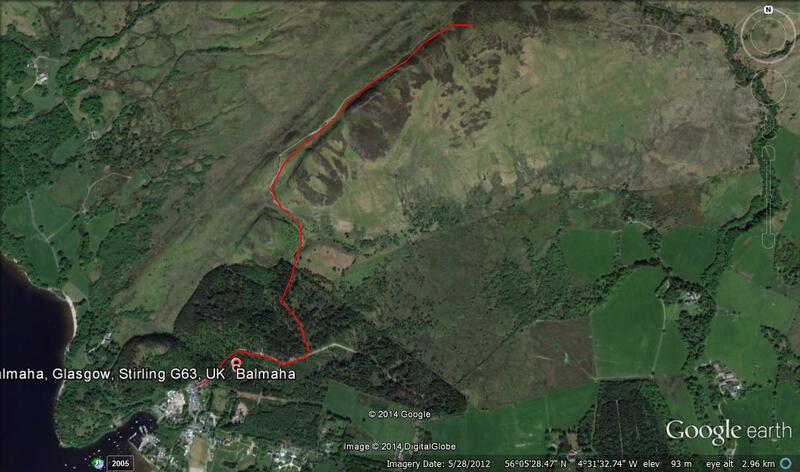 Although not part of our route (see below) it’s a good diversion. You will also come across a well-marked path on the left (Summit Path) which takes you a circular route through the highest point on the island. 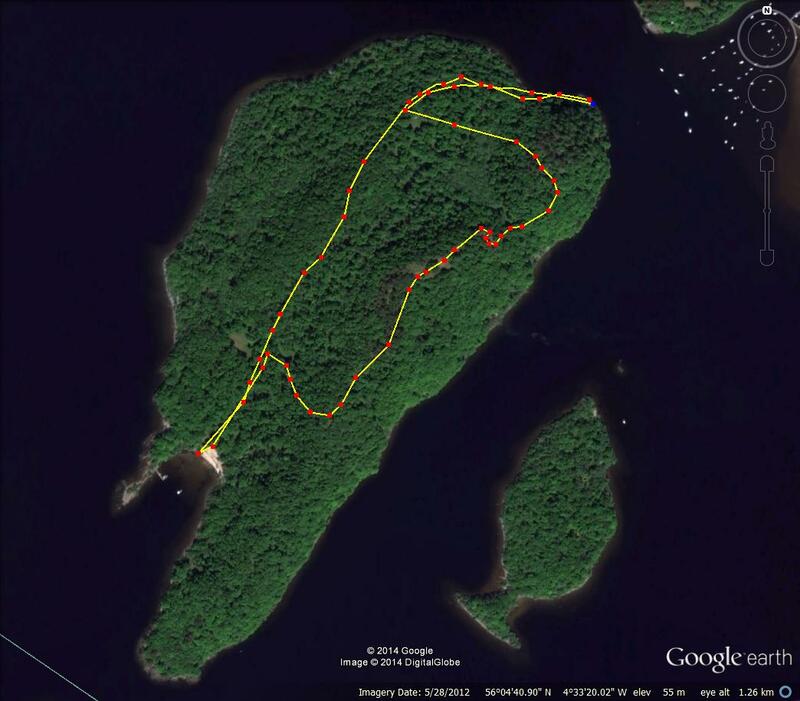 This is a great walk through the trees and provides some of the best views of Loch Lomond. Return to the main path and make your way to Port Bawn. On hot summer days expect large numbers of walkers and a party atmosphere. Return to the North Jetty via the Central Path and await pick-up. When you get back to Balmaha you can let the children play in the play-park, feed the ducks, or walk along part of the West highland Way. Whatever you do take time to have a wander around this enchanted place called Balmaha. This entry was posted in Loch Lomond and Trossachs and tagged island walks, west highland way on November 6, 2014 by scotlandwalkswithchildren. Walking conditions – Good well-defined footpath, slightly steep in places. No difficulties. Conic Hill sits directly on the Highland Boundary Fault Line and is a joy to behold. 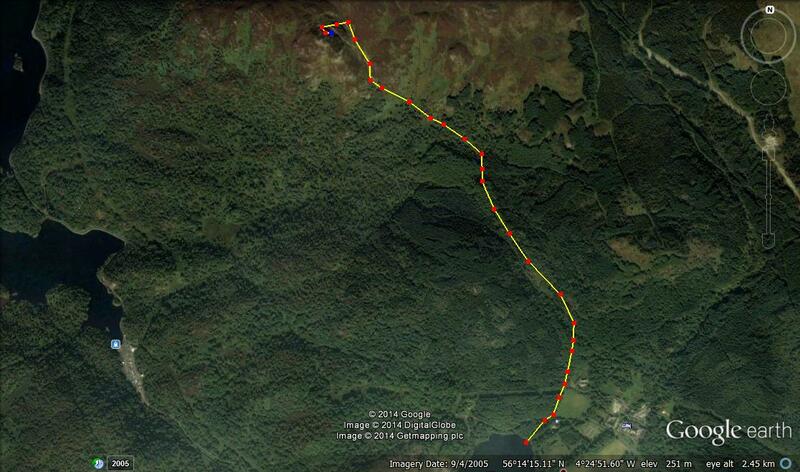 Conic Hill also bailed me out of a very tight spot once. It was around New Year and I had just invited my future wife out on our first date. The plan was to go ice skating in George Square, Glasgow. However, when we reached George Square to my horror the temporary ice rink was no longer there. Thinking quickly I suggested a trip to Balmaha and so it was agreed. 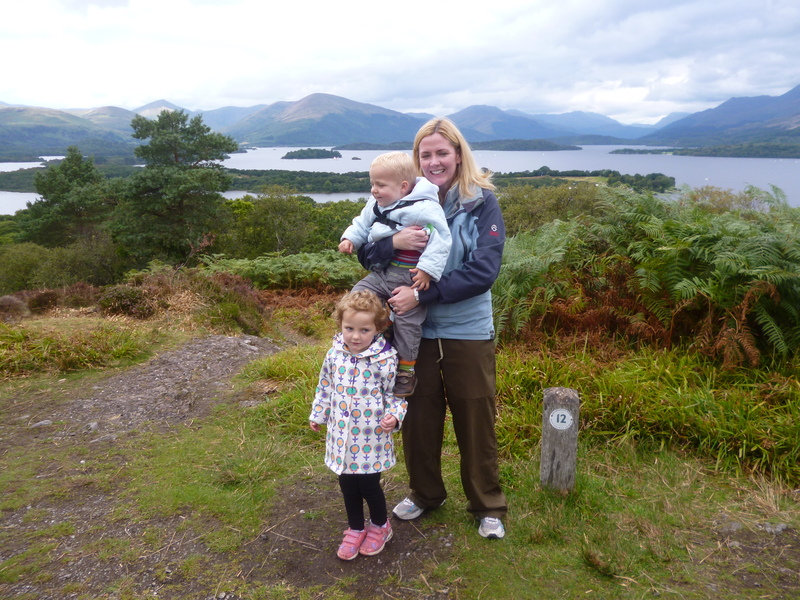 As we sat in Balmaha having dinner in the Oak Tree Inn the allure of Conic Hill proved too much. Re-assuring my future wife that her Converse pumps were adequate for a walk up Conic Hill in fading light and icy conditions we set off. Unbelievably, it actually went well although I have to say that I do not condone this type of reckless behaviour, but that’s first dates for you. 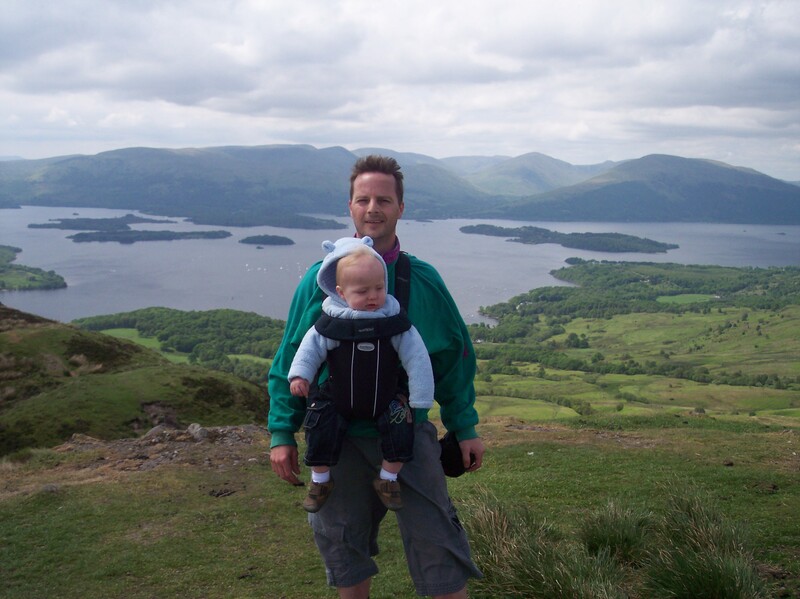 Then again, you could never go wrong with a trip to Conic Hill. Start your walk from the large car park at the foot of Conic Hill and next to Balmaha’s Visitor Centre (the car park fills up quickly on bright summer days so get there before 11 am on these occasions). Follow the forest track as it winds its way through the trees remembering to take a left at the first junction. From thereon it is a fairly steady ascent through the trees for a few hundred metres until you reach a gate at the end of the forest. As you walk onto the open ground you immediately start to appreciate the splendour of your surroundings. The path continues to climb a little steeply in some places until you are on the shoulder of Conic Hill. From here on in it’s just a steady climb to the top. You have the choice of staying on the path or walking directly up the shoulder for a better view. When you reach the top you will be see a trig point surrounded by a diverse range of people. Some will be wearing full Gortex waterproofs whilst others will be wearing Converse pumps. They’ll all be smiling and gazing out over Loch Lomond. Return via the same route. When you get back down you can let the children play in the play-park, feed the ducks, or even go on a boat trip to Inchcailloch Island. Whatever you do take time to have a wander around this enchanted place called Balmaha. This entry was posted in Loch Lomond and Trossachs and tagged balmaha, highland boundary fault, west highland way on October 29, 2014 by scotlandwalkswithchildren. Walking conditions – Well defined footpath, muddy in places. Some steep rocky sections where children may require some close supervision and assistance. As a child living in Blantyre I learned that our drinking water came from Loch Katrine. I was entirely unaware that a boat named The Sir Walter Scott sailed on Loch Katrine on a daily basis. Equally, I had no idea that Ben A’an, a fantastic mini Alpine-esque hill sat beside Loch Katrine and that one day, a large photo canvas of my wife cuddling her little Lakeland Terrier on the top of Ben A’an with Loch Katrine in the background would take pride of place in my kitchen. Taking nothing away from my wife or her dog for that matter, but a photograph of Ben A’an and its surroundings on a clear day is a joy to behold. From the car park cross the road and follow the footpath as it winds its way up through the trees and over a little footbridge across a stream. After about 700 metres the ascent becomes a little gentler giving you the chance to stretch your legs on an easy stroll for a few hundred metres. It also provides the children with the opportunity to explore the numerous ‘dens’ and shelters constructed from upturned trees and branches and is the home of man-eating dragons, or so I told the children. The truth is probably far less exciting as I presume the ‘dens’ were built by youth groups participating in award schemes. Anyway, at about the 1.2 Km point there is a small clearing on level ground where you can see the top of Ben A’an and the final ascent which is fairly steep in places. Care should be taken as a trip in one of the steep sections could lead to a nasty injury, so please make sure you’ve got a firm hold of small children. Although steep, there are no difficulties and as you leave the trees you will be immediately overwhelmed by the magnificent scenery. It’s always a busy summit full of happy faces so bring a hearty picnic and a camera. Return via the same route. The Harbour Café at Loch Venachar which is located a couple of miles up the road towards Callander is a great spot to stop for lunch or dinner. It sits on Loch Venachar and you can get a table on the pier. My wife recommends the scallops with black pudding. 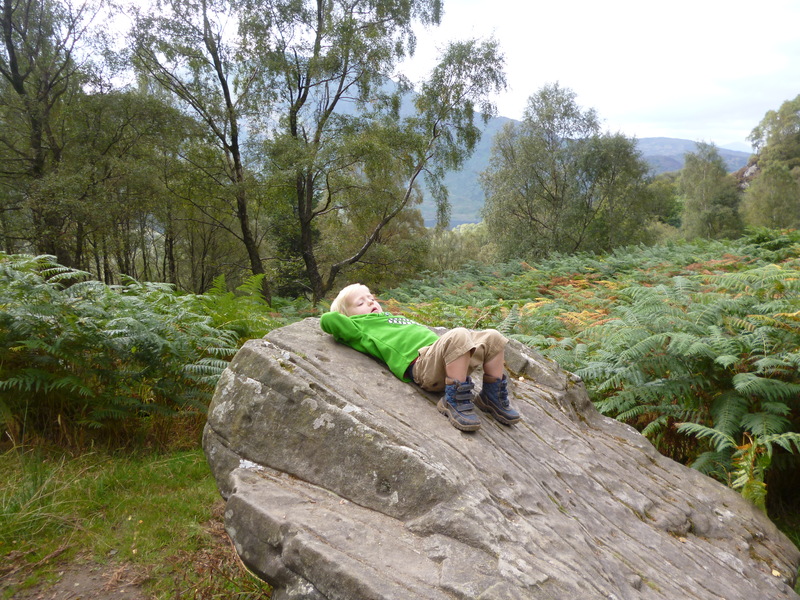 This entry was posted in Loch Lomond and Trossachs and tagged Aberfoyle on September 28, 2014 by scotlandwalkswithchildren.